An example of using it is illustrated in the image below. First run: We target two clusters. 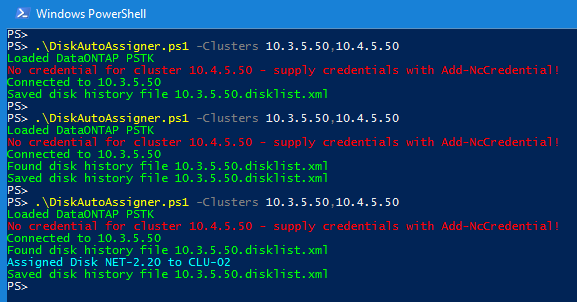 We only have the credential for one cluster so the program just connects to that. 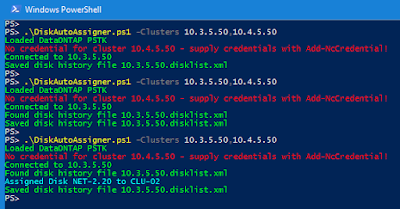 We’ve not connected to this cluster before so we save a disk assignments XML file. Second run: Like above, but since this is our second/a subsequent run, we have a disk history file for 10.3.5.50. The program checks for unassigned disks, and checks these unassigned disks against the previous run. If there are no unassigned disks that weren’t previously assigned the program does nothing. Third run: I’d unassigned disk NET-2.20, and the program detects this and assigns it back to the original owner. Note: This was tested against a NetApp Clustered ONTAP 2-node 8.3.2 SIM cluster. Copy into a text editor and save as DiskAutoAssigner.ps1. ([String](Get-Date -uformat %c) + " | " + $Category + " | " + $P) >> "DiskAutoAssigner.log.txt"
Get-NcDisk -Attributes $DiskAttrs | Export-Clixml "$_.disklist.xml"